No, this isn't an actual album, but a collection of b-sides, bootlegs, and appearances on other artist's albums from Bri-Bri's glam-rockin' heydey. It would have made a great album, tho, for fans of the man's "Warm Jets"-to-"Before And After Science" song-oriented work, which would include, I would imagine, most of you-all at some point in your lives. I'm surprised that Eno or his labels have never put together a collection like this, seems like a natural. As he is one of the most famous/popular avant-rockers in history, you think they'd be trying to milk it they way they're doing with the Velvet Underground. No ambient stuff here. The Cluster tracks are certainly atmospheric, tho still actual tunes with vocals/lyrics. The three tracks from "Peter and the Wolf" are instrumentals, but they rock - Eno going nuts on the synth, like his solos on Roxy Music songs like "Editions of You." 10. The Fat Lady Of Limbourg "
12. Wolf and Duck "
Thanks to pj for the artwork! Thank you. Really, really nice to have these all in one place! An attempt, of sorts, was made at a compilation of 'Pop' tunes entitled 'More Blank Than Frank'. I had a copy which disappeared, but I still have the insert art-work entitled 'Baby's on Fire'. I think it was part of a larger project, but time has erased my memory of what it was. 'Music in the World of Islam' has a lot to answer for IMHO (though I really like the lute disc). You are all very welcome. OSM, I looked up that album, and it is a comp of his pop tunes, but no rarities - just yer basic album tracks. I'm still first! Indeed, your crown remains untarnished and rightly so. Great idea to collect all these together. b-sides. Can give you the address if you want investigate. In the meantime here is a cover I have made for this comp. Thanks pj, but where's the cover? Sorry,don't know what happened there - I copied your address by mistake ! Excellent! Thanks so much pj, really appreciate it. Whoa! Thanks a lot, really appreciate this! Mr. Spaceman, I had the cassette version of More Blank thank Frank. I bought it because there were more tracks on it than the album. Later I grabbed the CD version in a cutout bin, but it was considerably more subdued than the album or tape. Thanks so much for this post, Mr. Fab. You've healed my virtual copy of My Life in the Bush of Ghosts. I knew it deviated from the LP, and I still consider the LP to be the better, more concise and higher quality version of the two. Thanks for this great comp - listening to it now! Very interesting! Can't wait to hear it. Brilliant idea. Somebody out to approach Island or whoever and release this as it appears here. 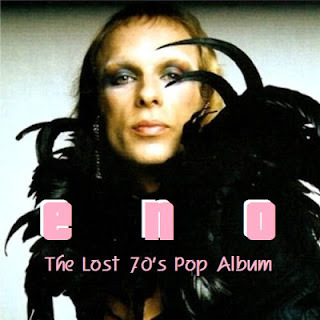 So great to hear all these hard to find Eno tracks in one place. Cheers.